I visited one of the top schools in Navi Mumbai for a career guidance session for their 12th standard students. After talking to them it came as a shock to me to see people know so little about the industry. There’s hardly any awareness. I shared with their coordinator the link to our website, the teachers were surprised to see the potential the industry has. They thought that it wasn’t meant for the Science stream, as they were ‘good students’ focused on making a career in the conventional streams like medicine or engineering. I shared my own story and that of the ladies featured on our website. The coordinator asked me if I could address the Science students too, it was a last minute arrangement as the teachers felt that they would benefit too. I went to their class and did a brief intro of the hospitality and tourism industry and the careers that they offered. The commerce students were present for the career guidance session that was planned for them. The coordinator then asked if she could get the students for an industrial visit to our institute. Which we did plan and had it executed. The feedback was very encouraging; we got some interesting questions from the students. I guess I did one good turn for that day, a small step but a beginning for something substantial. The idea with which the website was created I did seen the impact of that. I need everyone connected with the industry to join hands in this mission. I also saw the IWH website and blogs/stories being appreciated and shared by bloggers. Some messaged me saying that they didn’t know much about the industry and women in particular, IWH did a good job by not only creating awareness but also sharing success stories. Heartening isn’t it? How many of you have shared the website or stories from here? Let’s all reach out and create awareness, also help people make great careers in the industry. We are turning three months! We’ll turn 3 months on 7th May 2018. What should we do to celebrate this mark is a question on my mind? I was thinking that we should reach out to more ladies from Hospitality, Tourism and wellness sectors. Requested the 1670 + incredible ladies to introduce the group to their colleagues and friends and they could be a part of IWH as well (the closed support group on facebook). We should get more engaging stories and more activity on the group. We must have fun while we scale newer heights and expect everyone to take charge. The website is there for all to see, the reach is already there. Our idea is to create awareness and mentor people who are interested in creating success stories of their own as we have ladies onboard who have been there and done that! We did receive some really good testimonials; they validate the fact that we are on the right track and they become our oxygen fuelling more efforts and more power! 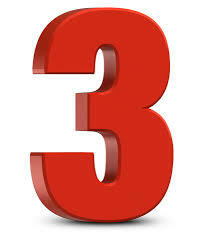 The rule of 3, or power of 3, suggests that things that come in threes are funnier, more satisfying, more effective, and/or more memorable, than other numbers of things. Something that is incredible, unexpected, or powerful. Always remember that you’re braver than you believe, stronger than you seem, and smarter than you think. That’s the power of three too!